On this 2-hour orientation, say hello to beautiful Niagara Falls, one of the greatest year round natural destinations in the world. Your personal driver will greet you at the prearranged limo waiting area inside Lester B Pearson International Airport in Toronto. He or she will assist you with your luggage to your casually upscale, private vehicle. You will then travel non-stop, unless you wish to stop, to Niagara Falls, Canada. 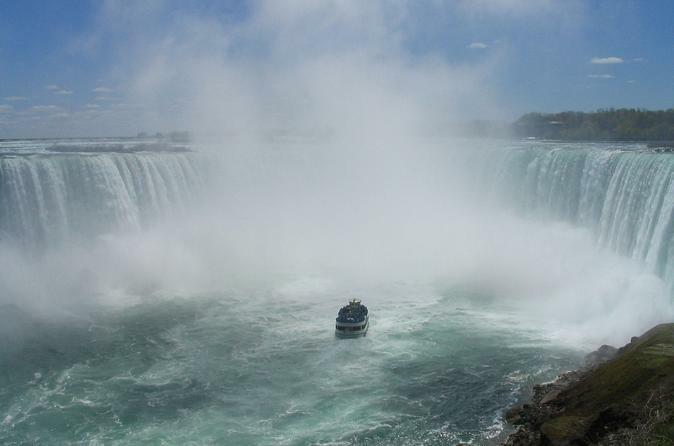 Once in the Falls you will be treated to a viewing of the Niagara Gorge and the Water Falls, as well as a 20-minute overview tour of this beautiful city and its many attractions. You will then be dropped at your hotel. After your airport pickup from Toronto International Airport, your driver/guide will take you down the exquisite Niagara Parkway and offer you your first fantastic view of the Niagara Gorge, the Rainbow, Bridal Veil and Horseshoe Falls. Stop along the way for photo opportunities. Then climb Murray Hill, travel through the Fallsview Hotel District and view the Brink of the Falls and the cascading Niagara River. Next, head down Victoria Avenue and Clifton Hill and onto your hotel. During this 2-hour transfer and tour, your driver will answer all of your questions about attractions, wineries, dining and things to do. There is something for everyone in Niagara Falls. Niagara is the most dynamic four-season destination in the world. Whether it be the spectacle and wonder of the Falls itself, the smell of ripening grapes, fine dining, a day or night out on the town, shopping, or a visit to one of the attractions, you can rest assured that you'll find exactly what you are looking for.